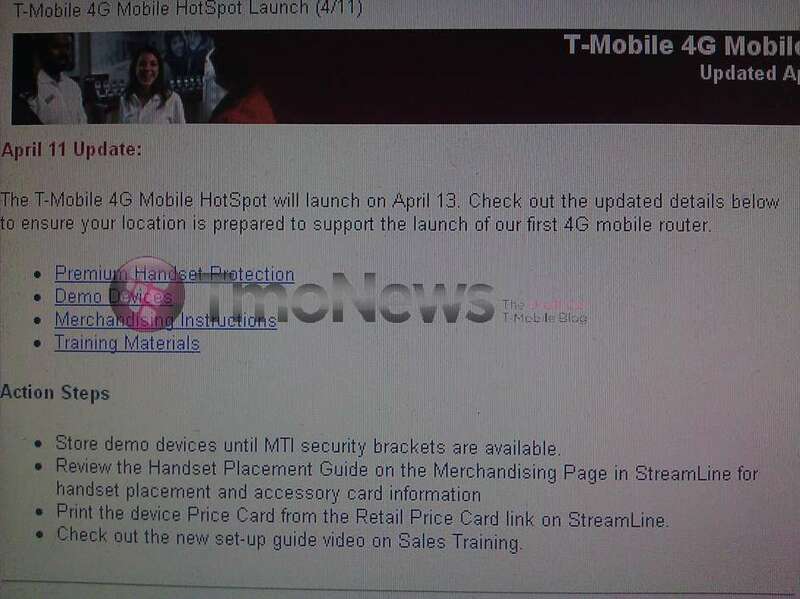 Update: The T-Mobile 4G Mobile Hotspot will be $79.99 after a $50 mail in rebate. Sometimes these things happen fast as it was just this morning we were able to post one of the first retail packaging shots of the upcoming T-Mobile 4G Mobile Hotspot. Along with that our ninjas have been able to confirm the rumored April 13th launch date and now we are able to absolutely confirm it with the above screen shot. On top of that we’re hearing it will drop with a $79.99 price point though we must point to the just posted 4G Mobile Hotspot comparison chart which shows a $49.99 price. In any event, you’ll be able to get your hands on the Mobile Hotspot device in just two days. So much for competing with cable! 5 GB cap? Comcast is 250GB/month! Be real, competing with cable which is stationary, is like mentioning a wheel chair can beat a bike. Just because they do the same thing doesn’t mean it’s the same competition. Actually, it’s fair to compare to Comcast, Clear, and other internet service providers. T-Mobile is offering this internet plan to be used with computers, not phones. If T-Mobile puts a low data cap of 5gb on this plan, it will be no better than wireless tethering with an Android phone, and $50 will be a ridiculous price. Clear Wireless offers unlimited 4g access (with no throttling) for around $50 a month. good luck taking your Comcast (or other home internet provider) with you wherever you travel. And Clear doesn’t have the same network footprint as T-Mobile, and it’s $10 more a month than a 5G data plan (assuming you have T-M for your cell phone too). Ache Tee See Peer A Mid. I heard rumor that it may launch this week. Oops Pyramid. That’s definitely not coming out this week :) They only just announced it officially today. I dont see this as much of a splash. Its a very niche product that most smart phone users wouldnt consider. Though these are great for what they do, I don’t see many ppl taking full advantage of this device. Android devices already do what this Mobile Hotspot can. We’ll see how they do. Pretty much all devices can do what Mobile Hotspots can.